Recently received a set of 4 x VM34 power jet carbs from a TZ750 for UFO fitment. The customer told me they had been bored out to somewhere around 35mm. At first inspection, it was obvious there were problems. The boring job looked like it had been done concentric to the original factory bore. 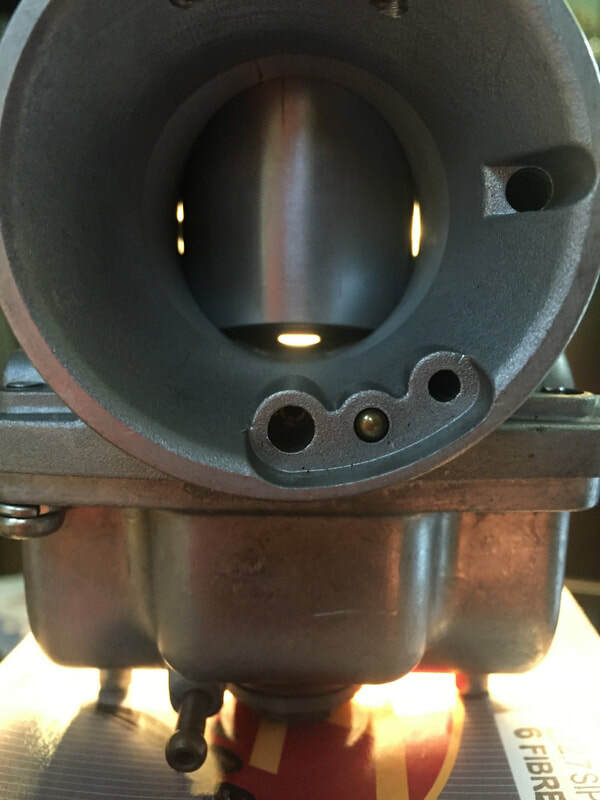 Because of this, metal had been removed at the bottom of the bore which would otherwise provide the bottom edge seal on a closed throttle. You will see from the photo that with a closed throttle, the slide sits quite high. This would stop the carburettor from achieving a fully shut throttle and may leave it with an “idle”. Overboring if there is enough metal to do so, is normally done slightly high to retain the sealing edge at the bottom of the bore. The point of us machining the body after fitting the UFO is to make sure the slide sits down properly on a closed throttle. It is not possible to do this if the metal has been machined away. The second problem relating to the overbore is the amount of fresh air slipping down the sides of the slides as there isn’t a sealing surface there anymore. You can see this quite clearly by the light shining through at the sides of the slide. The diameter of the slide in a VM34 is 35.5mm. The same slide is used in the VM30, VM32 and the VM34. You can see if you bore the 34mm version any bigger, it will cause problems which cannot be addressed. Unfortunately, I couldn't fit these carbs with UFO’s for the reasons above. The carbs are probably not usable in the condition they’re in. The bodies are probably scrap.